7th & 8th Grade Communication & Media Arts students at the CAA visited the Moline Public Library on Monday, March 12th to experience the “I-74 River Bridge: A Virtual Experience,” a virtual reality tour of the new I-74 bridge. The intense, immersive virtual environment makes it possible for the Iowa DOT and other agencies to give you a more complete understanding of how infrastructure projects will look and interact with the surrounding environment. 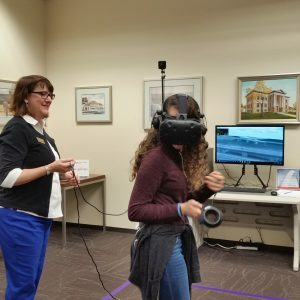 The Moline Public Library will be hosting the “I-74 River Bridge: A Virtual Experience,” a virtual reality tour of the new I-74 bridge, through May.